AIM: To determine degree areas of the zodiac and planetary aspects or angles which, when highlighted by transit or eclipse, signal marked move in XBTUSD (Bitcoin-USD). On October 31st, 2008, a white paper, outlining the idea of a purely peer-to-peer version of electronic cash was released. In this document, the concept was presented and offered a solution to the problem of money being copied. This was clearly one of the main foundation dates for Bitcoin which is now regarded as the first decentralised digital currency. We should assume that the idea had been incubating for some time and possible that this was reflected in the eclipse positions of 2008 (though agreed, the concept could have been in the pipeline for much longer) and in the outer planet positions and midpoints for October 2008. By October 2008, Pluto (using geocentric positions) had entered Capricorn in January (coinciding with the banking crisis at Societie Generale in France), had retrograded back into Sagittarius and would enter Capricorn fully in December of that year. It is entirely in keeping with this ingress that a threat to conservative banking systems would occur. As we know, this took many forms: not just in the collapse of the sub-prime mortgage system. The eclipses of 2008 affected the Leo/Aquarius axis whilst another dominant feature of the year was Saturn’s opposition to Uranus. Perhaps critically, in July, Chiron conjoined the Lunar North Node in Aquarius. The momentum for this white paper may well have become unstoppable from this period. On the date of issue, October 31st 2008, Pluto and Juno (often associated with money matters and with equality issues) were conjunct in the last degree of Sagittarius. It is entirely appropriate then that during the course of 2008, the idea of a peer-to-peer currency system – operating globally and free from many government restrictions – gathered momentum. In determining likely ‘reactive’ periods for this currency, we should, on the basis of facts listed thus far, make note of subsequent Pluto-Juno conjunctions, phases in the Saturn-Uranus cycle and, possibly, the degrees of the 2008 eclipses. On January 3rd 2009, and under the codename of ‘Genesis’, the first Bitcoins were mined. One of the very interesting features of that day is that Venus made Pisces ingress as Vesta made Taurus whilst one of the major planetary pictures of the day shows Venus at the midpoint of Pluto and Vesta. (My work suggests that Vesta is often prominently placed when currency matters feature in news-headlines). With Venus, Vesta and Pluto all at 0 degrees of a sign, we should also pay attention to subsequent ingresses (including the Sun crossing these degrees). By close of trading in New York on Jan 3rd, 2009, there was a stellium in Aquarius leading with Jupiter at 0 Aquarius, followed by Mercury, then the Node and then Chiron and Neptune. Again we have another major ingress taking place. Accent on the sign of the zodiac most associated with forward-thinking (Aquarius) is entirely appropriate for Bitcoin as is the fact that in October 2009, and a year after that white paper was published, the New Liberty Standard established a value of $1 – 1,309 Bitcoins (BTC). This exchange rate was calculated using the average amount of electricity required to run a computer with high CPU, multiplied by the average residential cost of electricity in the US for the previous year, then divided by 12 months and by the number of bitcoins generated over a 30 day period. All very Aquarius! In February 2010 (with the Sun in Aquarius and passing over the earlier Aquarian stellium), the first Bitcoin market was established. Within two months, on May 22nd 2010, it was possible for a UK software developer to purchase a take-away pizza using Bitcoins. The Sun position on this date was at 0 Gemini: the exact position of Vesta in the January 2009 chart. The next key date is August 6th 2010, when the first major hacking incident was identified. This unexpected, shocking and dramatic event was fittingly signalled by Uranus’ arrival in Aries where it opposed Saturn in Libra. A ‘high’ had actually been reached in June when Saturn made Libra ingress. Note that Saturn and Uranus are said to be co-rulers of Aquarius so that the ingresses of these planets and their angular relationship to one another is likely to highlight key dates and periods for this fledgling currency. Tentatively we can draw the conclusion that when 0 degrees of any sign is highlighted – especially 0 Gemini or Pisces– or when Saturn and Uranus reach key turning points (major divisions of their cycle), that there will be sharp moves in Bitcoin value. The hacking incident led to the discovery of other vulnerabilities in the blockchain. These were followed by an inter-governmental group suggesting that Bitcoin could be used in the financing of terrorist groups. The Plutonic nature of this can be discerned from Bitcoin’s initial (January 2009) chart –not least the Mars-Pluto conjunction, but also Mercury’s position at the Venus/Pluto midpoint. In January 2011, The Silk Road, an illicit drugs marketplace, was established using Bitcoin. This offered an untraceable way to buy and sell drugs on line. The high probability of this development is shown by other key factors in Bitcoin’s chart: the Chiron/Neptune conjunction, Saturn’s opposition to Uranus in Pisces and Venus’ at 0 Pisces. Despite all this, in February 2011, Bitcoin reaches parity with the US dollar and by Wednesday June 8th, and as Jupiter made Taurus ingress sextiling Neptune at 0 Pisces, each Bitcoin was worth $31. For a few hours that day, and as Bitcoin reached these heights, a Grand Trine involving Jupiter and Pluto (a wealth cycle) and the Moon had formed. As the lunar aspects separated, so Bitcoin’s value fell. (It is interesting to note that Bitcoin had another ‘good’ day when this Grand Trine formed a month later in early July. There was a smaller increase – and unsustained lift in price in subsequent months when this same Moon-Jupiter-Pluto Grand Trine formed). The $31 level did not hold for many days. Mars moved on to square Neptune with both at 0 degrees of, respectively, Gemini and Pisces. The price plummeted and did not recover until 2013. The Sun, Mercury and Venus pass 0 degrees of Pisces and Gemini annually. A review of these transits and XBT (Bitcoin) USD trading over these dates since 2011 is valuable. In October 2013 Mars crossed 0 Virgo and Venus made Sagittarius ingress. These are both Mutable signs (like Gemini and Pisces). This might have put the trader on alert. As importantly – and as indicated earlier – in early 2014, Mercury would criss-cross 0 Pisces and degrees of Aquarius in the stellium in Bitcoin’s 2009 chart. The Sun passes these degrees on or around 19 February and 22 May each year. 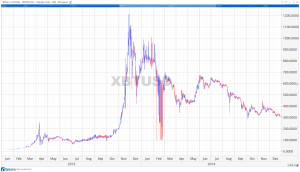 Analysis of XBTUSD (Bitcoin-US dollar exchange) from 2013 shows that only in May 2014 was there a dramatic move as the Sun passed one of these degrees (0 Gemini). Other factors must be taken into account. On May 22nd 2014, there was a first quarter Moon: the Moon at 0 Pisces (!) as the Sun made Gemini ingress whilst Jupiter and Saturn were a trine (120 degree) apart. The dates on which Mercury and Venus make Gemini or Pisces ingress varies from year to year. Again, analysis of 2013-2016 suggests these transits are of little importance. There is, however, one important exception: February 2014 when Mercury stationed on this degree. Volatility that month is evident. Mars will pass these degree areas every two years. There were sharp moves as Mars moved across 0 Pisces on 12th January 2015. If the XBTUSD relationship is indeed sensitive to the passage of planets over these degrees or eclipses at these degrees, then tentative forecast can be made. Mars reaches 0 Pisces on December 19th 2016 – and within 90 minutes of Mercury arriving at retrograde station and as the Sun passes the Galactic Centre. This may well be indicative of a day of considerable activity. The next key date is April 20th/21st 2017 when Mars arrives at 0 Gemini as the Sun crosses 0 Taurus with Mercury at that same degree and as Pluto stations. The position of the lunar nodes in any chart is hugely important. When a planet aligns with this axis or is at right-angles to it, major events tend to occur. March 2013 was an important period for the fledgling currency. The US Financial crimes Enforcement Network issued the world’s first Bitcoin regulation and Bitcoin’s market capitalisation reached $1bn. That month Saturn (restriction) was at apparent right angle to the lunar nodes of the January 2009 chart: symbolic of the application of regulatory controls. A surge in value to over $250 followed in April as the lunar node squared Chiron’s January 2009 position. It is not at all uncommon, where Chiron is involved, for there to be major correction. In this instance, and within the space of a week, XBT fell dramatically to 50% of its earlier value. Bitcoin came into being as Saturn opposed Uranus: an opposition that occurs approximately every 45 years. Both planets are said to ‘rule’ Aquarius. Recall that Bitcoin has a stellium in this sign. We should expect resonance between phases in this cycle and XBTUSD. Just as we saw that Saturn’s position relative to the nodes corresponded with major moves in this exchange, we should anticipate that major phases in any cycle involving Uranus will also correlate with strong moves in this exchange. NB That Uranus is the planet associated with electronics. From Q4 2013, Jupiter-Uranus and Pluto were locked in a key planetary picture. This is a highly unstable combination. The Uranus-Pluto square is indicative of shocks and upheaval whilst Jupiter’s position at the mid-point of the two could be said to magnify the effect. The period was also bracketed by two lunar eclipses: the first in October in Aries and the latter in Libra in April. The accompanying solar eclipses were first in Scorpio (November 3rd) and in Taurus (April 29th). Though these planetary pictures would be expected to affect all markets, we now know that Bitcoin was particularly sensitive to this planetary picture. This is vital historical information prior to making forecast. Now, in the second quarter of 2016, a variation on that Jupiter-Uranus-Pluto formation becomes exact mid-October. If XBTUSD continues to respond to this planetary mix, then we should expect significant activity on October 14th 2016. Note: This chart also shows curious movement a month earlier, in mid-July. The high that month coincided with Mars opposing the Solar position of the Jan 3rd 2009 chart whilst Mars itself opposed transiting Pluto. These aspects will occur every two years and may indicate a high in July 2017. As yet, the extraordinary exchange rate fluctuation on Saturday July 18th must remain a mystery – at least for now. The next spike in price was in early November 2015 and coincided exactly with Jupiter’s opposition to Neptune at 17 Virgo which marks one of the important degree areas in the NYSE chart. Mars is positioned at this degree and as may be seen when studying movements in the SPX, DJI and NASDAQ charts, as a planet crosses this degree, there is often marked movement. That the XBTUSD exchange rate responded to this planetary code is interesting. On the now growing list of conditions for major moves in this exchange rate we must include this apparent sensitivity. The methods so far described are based on transits to a supposed natal chart for Bitcoin. This though should not be the only method employed. It is arguably the best method until there is sufficient history to research but, with a few years of data and some clearly defined turning points now noted, we can turn attention to other methods of analysis and forecast. Two approaches are worthy of our attention: the time (number of days or weeks between significant events) and planet synodic periods. Major fluctuation in Bitcoin price began in 2013. In November of that year, XBTUSD crossed 400 for the first time. It is perhaps significant that it was above this level again in November 2014 and 2015 though not on exactly the same dates. Each time the level has been reached a few days earlier. 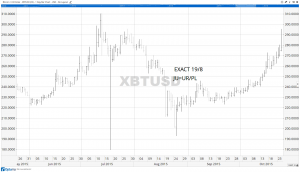 In 2016, we might expect XBT to be close to $460 perhaps in late October. 2016 Mid October it was Pluto’s turn to be on the Jupiter/Uranus midpoint. This transposition within a planetary picture is not unusual but, where Pluto is alone on one side of the equation can indicate slow burn. By contrast, if it were Uranus on the Jupiter/Pluto, results are more likely to be instantaneous. With this upward planetary thrust in place from mid-October, Bitcoin was poised to aim high once more. This was given further impetus by Mars opposing natal Uranus at the end of October. The last day of that month saw an exact conjunction of Venus and Mars on natal Saturn. This suggested that brakes would soon be applied. We might also note the eclipse degrees. It may be that as planets pass these degrees that change in price is greater than might have been expected. It may be that these planetary positions are part of Bitcoins DNC or astro-code. If that is the case, then the next step is to list these various events and see which, if any, have occurred since the end of 2014 and what then happened to the price.